Shoppers looking for innovative and affordable products for corporate giveaways of Christmas gift ideas flock to various bazaars in the Philippines. While most of these open beginning September, don't be surprised if you find some as early as July. The great thing about shopping in most of these bazaars is that you'll find a number of clothes, toys, knick-knacks, shirts, blouses, and other wonderful gift items at affordable prices. So don't get caught in the mad Christmas rush. Shop early, and shop wisely! FIRST COME, FIRST SERVE..LIMITED SLOTS ONLY!!! For details, please contact Mildreth @ 0927 604 6876. GT Tower International is one of Makati’s premier office buildings. With more than 40 storeys of office space, GT Tower houses many multinational firms like Metrobank, Toshiba, Toyota Financial, Facial Care Center, Marie France, Svenson, Accenture Call Center, McCann Erickson, ANZ Bank to name a few. GT Tower is right beside RCBC Plaza building. Island Cove Resort & Leisure Park is a 12-hectare island resort south of Metro Manila with hotel accommodations, sports & recreation facilities, several restaurants, conference and banquet facilities, and entertainment outlets. Located in Binakayan, Kawit, Cavite the resort is less than half an hour away from Roxas Boulevard via the scenic coastal road. Now you don't have to go too far to have the dream vacation you deserve. Island Cove is very accessible from anywhere in the metropolis. Revel in an environment of convenience and comfort, laid-back elegance and warn suburban hospitality. Pleasure is yours for the taking, with over 130 accommodation units ranging from romantic deluxe rooms to cozy family cottages. Club650 is a sports facility complex located along Libis that plays host to badminton courts, basketball court, volleyball court, futsal (indoor soccer), and a boxing ring. Club650 is the primary sports venue in the area, with several tournaments held almost every weekend. Club650 is also home to many retail and service establishments located in the lifestyle area like Sports Warehouse, Accel Sports, Mizuno Outlet Store, All Tera Bike Shop, California Nails & Day Spa, Honey Terrace Korean Restaurant, Rehab Six-Fifty Clinic, Hot Rocks, Goodah, Ice Monster, and many more! This area is highly visible to many people, as it fronts the daily traffic of 60,000 vehicles of C5 as well the bulk of Shopwise customers located right beside Club650. The Jestoni Alarcon Badminton Tournament will be held on March 24 & 25 as well at Club650. Club650 is right beside Shopwise. Hurry! Reserve now! Limited slots available! "BaZaAr AgO-Go Sa ATRIUM 2007!!!" LOTUS 1 ASIA TOURS & EVENTS MANAGEMENT is inviting all Non-Food Exhibitors/ Entrepreneurs / Concessionaires at this BIG EVENT to showcase your full product range and latest product lines and services to be able to share the best merchandise in the market. What: BaZaAr AgO-Go sa ATRIUM 2007!! !….The Fashion City Market..You’ve Gotta Have It! !…The First Ever Shopping Bonanza!! The Atrium of Makati is located in the heart of Makati along Makati Avenue with its 8-floors building housing four (4) of the top banks in the nation: BPI, MetroBank, Equitable PCIB and Landbank; Two (2) of the biggest government establishments, BIR and Pag-ibig Fund, Two (2) of the leading Newspaper companies, The Manila Bulletin and Phil. Daily Inquirer ,as well as Tricky Restaurant and Mini-Stop, a posh restaurant, Szwarlswalder; Dental office and the Channel Group of Companies. STRICTLY NO PAYMENT NO RESERVATION.. FIRST COME FIRST SERVE! !..VERY LIMITED SLOTS ONLY!!!.. REGISTRATION ENDS MARCH 23, 2007. "Corporate GiveAways and Urban Lifestyle Shopping Expo 2007"
"Corporate GiveAways and Urban Lifestyle Shopping Expo 2007" showcases the latest trends, ideas and solutions for your home, health, leisure and lifestyle. It will also showcase the latest Great FINDS,innovative and affordable products for corporate giveaways and personalized items for PRE-Christmas Shopping.. It's a mixture of a shopping and exhibit event. Entrepreneurs,first- time retailers,Participants & Concessionaires are welcome! 60 Booths Available! BIG DISCOUNTS FOR EARLY CONFIRMATIONS: We are giving 10% percent discounts for confirmations. An all year round bazaar in a fully airconditioned and secured venue. Over 80 booths of fabulous finds and fine food. The newest shopping haven in Quezon City. For inquiries we can be reached at 09174404690/ 412-3343. Apex Events brings you Christmas Wish Bazaar at Manila Sports Club, one of the most anticipated Christmas bazaars in Metro Manila. Come and join us as we bring you Christmas shopping at its convenience! Spoil yourself & your loved ones with over 100 stalls to choose from! Makati Sports Club is a high end sports club located on LP Leviste st. Salcedo Village Makati City. It is conveniently located at the center of a highly saturated residential condomium area where many rich and affluent people reside. Moreover, there are several commercial establishments surrounding the area. 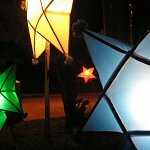 Every year, the Ateneo Management Association holds its annual pre-Christmas bazaar, and this year’s bazaar is entitled pAMAsko Bazaar 2007. 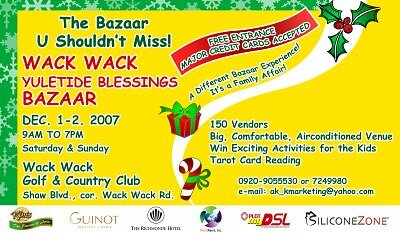 The bazaar will be held on November 24-25, 2007 in Sanctuario De San Antonio, McKinley Road, Forbes Park . It will run from 9:30 am to 7:30 pm, thereby optimizing your selling time. Situated at the busy heart of Makati City , this event is the ideal place for you to expose your products to the market and promote your services. It’s your chance to boost up your sales and obtain new customers and clients. The bazaar is expected to draw not only the Ateneo de Manila University community but also different people from all walks of life, raring to cash in their well-deserved bonuses for an early Christmas shopping spree. So you and your company will be assured of high profile exposure. Location: Sanctuario De San Antonio , McKinley Road , Forbes Park . 1. Booths would be chosen and assigned on a first-come first-served basis. 2. Each participant will be provided a tent that measures 6 x 6 ft.
3. ID’s will be issued upon full payment of space. 4. One (1) table and two (2) chairs, and electrical outlets would be provided. 5. There is no exclusivity of merchandise. We are looking forward to working with you in making one of the greatest pre-Christmas shopping experiences possible this Holiday season! Be part of AMA’s annual pre-Christmas bazaar, pAMAsko Bazaar 2007. For more details and further questions, please do not hesitate to contact us. It's a different bazaar experience! 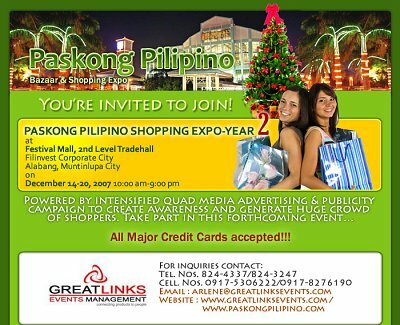 ** Be an exhibitor or even a sponsor..
Apex Events proudly presents "MALIGAYANG PASKO '07!" Pre-Cristmas Bazaar. The biggest shopping event in 2007, now on its 4th year! Bigger & better than ever before! Join us as we celebrate the Christmas season with loads of surprises, fun shows & major raffle prizes!!! Spoil yourself & your loved ones with over 150 stalls to choose from! Avoid the hassle of overcrowded malls! Free entertainment programs for the whole family on both days!